Living abroad for major holidays can be a total bummer. All your friends and family back home are together again and you're not. And everyone is eating turkey, pies, and all sorts of food that's unavailable where you are. I've spent many a Thanksgiving abroad, with feelings ranging from not even noticing it had passed to wanting to kill someone for a slice of pecan pie. But last year I said BASTA, ENOUGH, I can cook a turkey. How hard could it be!? 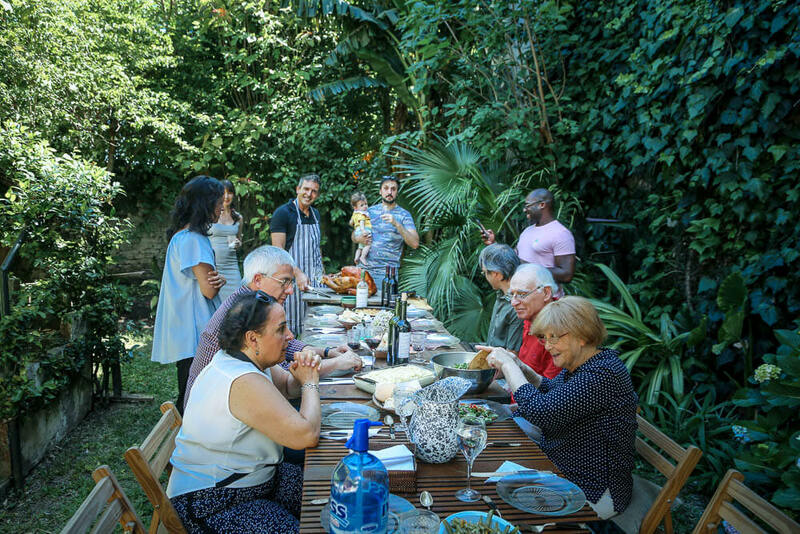 I invited all of my Argentine in-laws and my fellow expat friends and hosted my first Thanksgiving. And I think it turned out pretty well. I just used my thumb to wipe a smudge of turkey grease off my computer screen, the dog is so full of table scraps he doesn't want breakfast, and our recycling bin is full of wine bottles. 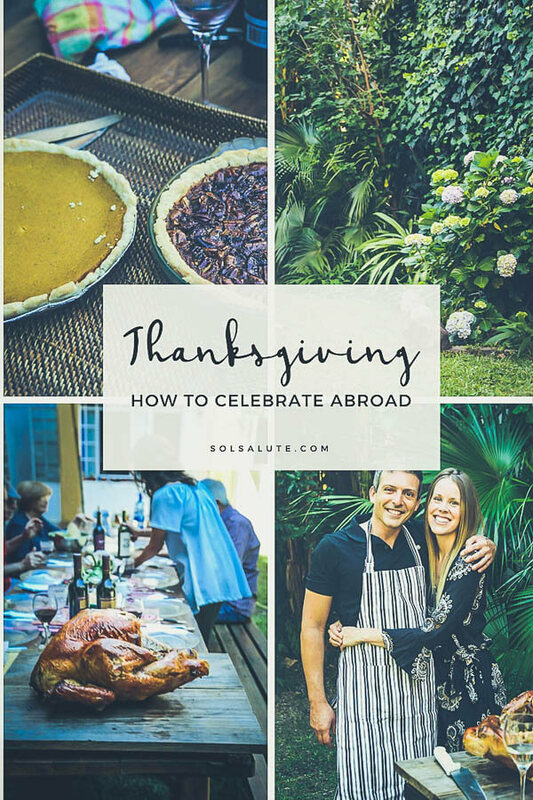 Here are a few of my tips and hacks on how I cooked and hosted a classic American Thanksgiving abroad in Argentina. In red-meat centric Argentina, Turkey isn't very common. However, it's not difficult to get either. 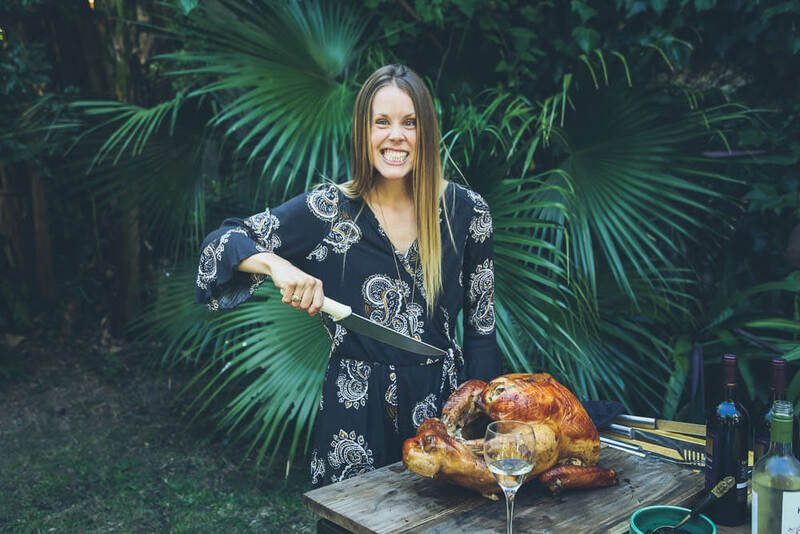 Ask your local butcher shop (or granja in Argentina, shops that focus on poultry), if they can get a turkey for you. Even though you don't see a certain food in your local shops, it doesn't mean they can't get it on request. For obvious reasons, shops don't stock anything that isn't in high demand but will get that mascarpone cheese, jalapenos, or even that turkey for you, if you give them enough advance notice. We got our Turkey at Piaf across the street from the Mercado de Pulgas. Cranberries are impossible to get in Argentina. While dried cranberries are available at an exorbitant price, anything to replicate that can-shaped blob we always pretend to love every November is non-existant. So I improvised. Cook down a pound of blueberries, half a cup of sugar, and juice from half a large lemon over low heat for about 20 minutes. My mother-in-law brought me lingonberry jam from Sweden, so I added about a cup of that to make it a bit closer to "cranberry-ish." The marmalade made it too liquidy so I simmered it for about an hour extra until it thickened up. Mission accomplished. We didn't even have to pretend to like the "cranberry" sauce this year! Mashed potatoes are the easiest side dish. You can find the ingredients anywhere in the world and have it taste just like home. If you happen to be in Argentina, Tregar Cream Cheese is a gift from God above and you should add it generously (if not available, the more heavily stocked Casancrem is fine). The casseroles and the bacon wrapped recipes all over Pinterest are tempting, but when it comes to the beans, and most sides for that matter, simple is best. Keep It Simple Silly. There are enough carbs and fat in the pies, the turkey, and the potatoes, so keep the veggies clean. I boiled one pound of green beans until soft, then sauteed them in a pan with garlic and butter (I suppose I could have used olive oil). To puree your own pumpkin, start by not stressing out when you can't find any orange jack-o-lantern pumpkins in your new country. Butternut Squash is the perfect substitute, you won't even notice the difference. Cut it in half longways, then cut the halves into smaller, manageable pieces. Place them in a pan. Roast them for one hour at 175'C/350'F. Let them cool before peeling the skin off. Blend it in your food processor/blender/nutribullet. You may need a splash or two of water to help it blend. DONE. Proceed to make pumpkin pie. I googled a lot of gravy recipes and a lot had 10 or more ingredients. You do not need these. I repeat you do NOT need these. Toss (carefully pour without scalding yourself) the drippings from your cooked turkey into a skillet. Simmer these drippings for about 10 minutes. Use a slotted spoon to get out any chunks. Shake up 1 part flour, 1 part water in a sealed jar to blend. A fourth a cup of each should be enough for a 10-14 pound turkey. I accidentally bought an enormous bird though, so I used half a cup. Pour the flour/water mixture into the simmering drippings. Whisk and simmer, whisk and simmer. GRAVY! Add pepper and salt (unless you brined your turkey, then back away from the salt!). Go for it, brine that bird. It was very easy. Brining your turkey will ensure a moister finished product. (I'm sorry I said moist). When in doubt for recipes, go to The Pioneer Woman. I made her brine recipe 2 days before I cooked the turkey. 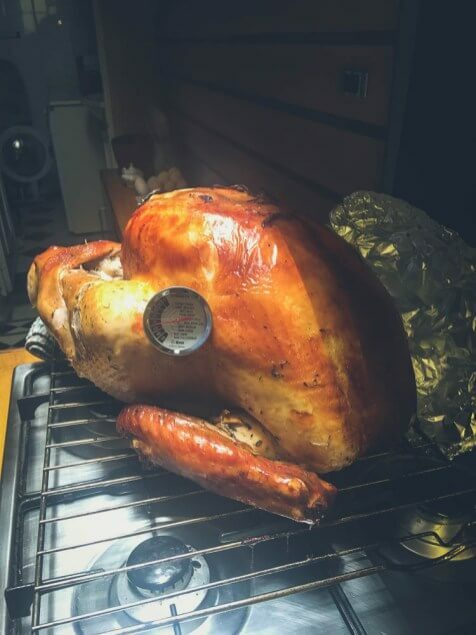 I planned on putting the turkey in the oven Sunday morning at 8, and I needed to have it bathing in its brine bath 24 hours beforehand. I made the brine Friday night since I didn't want to be boiling up brine like a witch over a cauldron at 6 am on Saturday. Brine your turkey for at least 24 hours. 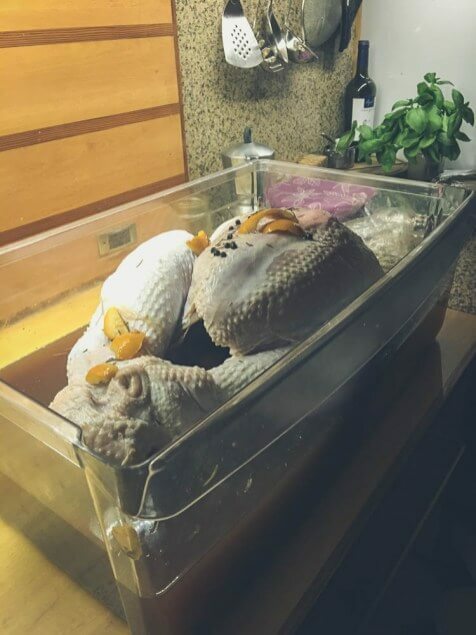 If the brine doesn't completely cover the bird in the container you have, just flip it at the halfway point. There's a product for everything in the US, and a cheaper version available on Amazon. It can make you panic when you're abroad and the incredibly specific thing you're convinced that you need doesn't exist. Think outside the box. What would grandma do? Did grandma have Target and Pinterest? No, she did not. Brine containers are just buckets, brine bags are just oversized plastic bags. You SURELY have something like this at home. We used our refrigerator's vegetable drawer. It was a perfect size and it was more space efficient than trying to make room for a giant bucket in the fridge the day before Thanksgiving, the largest food holiday of the year! Just give it a good scrub. make sure there aren't any cracks, and maybe place your turkey in the drawer while it's still wrapped in plastic first, just to be sure it fits. We don't have a roasting pan, so rather than buying something I'll use once a year, we improvised. We placed the turkey directly on the oven rack on the lowest height and placed the broiler pan directly below it to catch the drippings (save these, see gravy above). You can also just put the turkey directly on the broiler pan, on a bed of vegetables to keep it lifted. Whatever you can prepare ahead of the actual day of, do it! I roasted and pureed my squash/pumpkin 4 days in advance. I got my groceries a week before so I wouldn't have to be running errands last minute. Most importantly, I did the bulk of my cooking the day before: baking the pies, making the cranberry sauce, and cooking the potatoes. Prepare ahead of time and save yourself a lot of headaches. Not everything has to be perfect. Not everything needs to look as picture perfect as the photo from your cookbook. And you don't have to cook every single dish. I skipped the stuffing and my pie crusts looked gnarly. Nobody cares, they just want to eat. Don't stress. 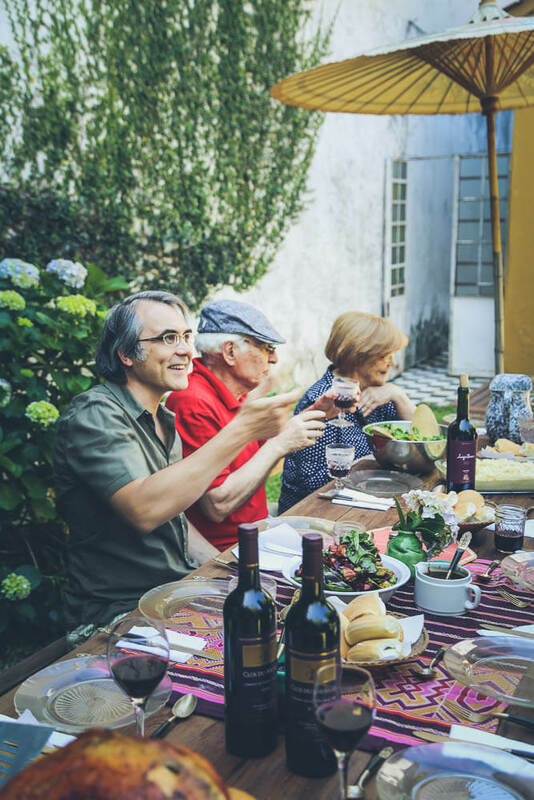 Pour yourself a generous glass of wine and enjoy your meal. You've earned it. Disclaimer: I'm not a chef, I'm not a cook, I have a degree in hospitality management but I preferred rooms management to restaurant management. So, this is just one woman in a kitchen trying to help. This is what worked for me, and I hope it helps you!